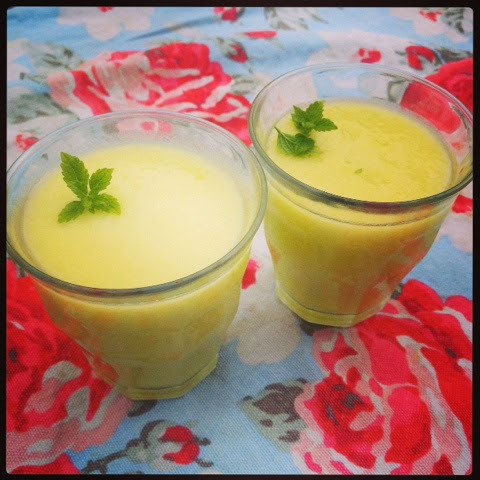 Another surprisingly yummy smoothie to tickle your taste buds is this melon and pineapple smoothie, they are in full swing in the shops at the moment. It's hard not to get lured in by them as you walk past them in the isle their aroma is captivating..
Once you have removed the hard outer layer of both fruit pop them in your bender along with the yogurt and whizz them up until smooth. Iv only used a small amount of yogurt in this smoothie as the fruit is extremely juicy and the consistsancy would end up to watery. This smoothie is a real thirst quencher not as sweet in taste as most smoothies very summery indeed.